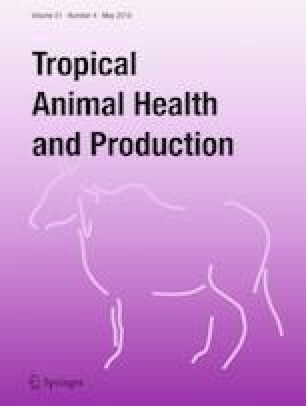 The variability in breeding program leads to rapid loss of genetic potential for which National Bureau of Animal Genetic Resources is emphasized to conserve the indigenous breeds. The variation in myostatin (MSTN) gene and its association with growth traits will throw light on its potential use as marker in selection. Hence, the study was conducted to detect polymorphism in exon 3 of MSTN, one of the most important growth regulatory gene and its association with growth in Nilagiri sheep breed. Blood samples were collected from Nilagiri sheep (n = 103) of South India and growth data up to 1 year of age was recorded. Genomic DNA was isolated and amplified for part of MSTN gene; PCR products were genotyped by restriction digestion (MspI) and confirmed by sequencing. Restriction digestion has revealed a single nucleotide polymorphism at locus G5622C in exon 3 which was confirmed by sequencing. The wild-type DNA molecule (MM) cleaved by MspI produced 301-bp and 314-bp fragments and those with mutation (mm) would remain undigested. The genotypic frequencies were MM (0.689) and Mm (0.311) with complete absence of mm genotype; and allelic frequencies were M (0.8445) and m (0.1555). The locus was in Hardy-Weinberg equilibrium. The association analysis revealed that there was no significant difference in mean birth, weaning, 6-, 9-, and 12-month weight between MM and Mm genotypes at g.5622G>C locus of exon 3 of MSTN gene. This is the first report of mutation in exon 3 of MSTN gene. The non-significant effect and absence of mm genotype at this locus needs further studies based on large population size and haplotype analysis. The authors are thankful to the Sheep Breeding Research Station, Sandynallah, TANUVAS, for the necessary support to carry out the research work. Dehnavi, E., Azari, M.A., Hasani, S., Nassiry, M.R., Mohajer, M., Ahmadi, A.K., Shahmohamadi, L., Yousefi, S., 2012. Polymorphism of myostatin gene in Intron 1 and 2 and Exon 3, and their associations with yearling weight, using PCR-RFLP and PCR-SSCP techniques in Zel sheep. Biotechnology Research International. Article ID 472307, 5 pages. https://doi.org/10.1155/2012/472307. Report, 2008. Sheep Breeding Research Station, Sandynallah. TANUVAS, Chennai, (available at http://www.tanuvas.ac.in/SBRS.html).